Congratulations to Russia's Sergey Karjakin for winning the World Rapid Chess Championship in Astana, Kazakhstan a few minutes back. In the end, it was the steady performance, the cool head, and the pure chess that counted. Karjakin put his overnight loss to Magnus Carlsen behind him and went on to win the World Championship a full point ahead of World No. 1 Carlsen! It appeared that Magnus Carlsen would run away with the title particularly after he finished Day 2 1.5 points ahead of the field. But, as the stats pointed out, he had not yet played the stalwarts. The third day was a self-destruct for him. He began the third day with a win over Ismagambetov, but went in for two straight losses against Vassily Ivanchuk and Alexander Grischuk. The next draw against Radjabov put him out of contention for the title. 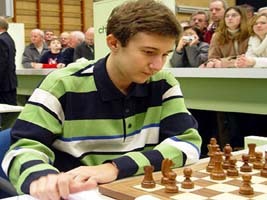 In the final round, he might have even lost the silver medal had Veselin Topalov not missed the endgame win. Eventually, the silver went to Carlsen and the bronze went to Topalov. The World Blitz Chess Championship 2012 would be held on Monday and Tuesday in Astana with 15 chess games played each day.